Any issues during your pregnancy? Before this pregnancy I'd had two miscarriages and my OB believed one was due to a blood clot in my uterus. She had me take blood thinners (Lovenox injections) from the moment I had a positive pregnancy test. I gave myself a shot in my stomach every single day, which was completely awesome since I'm absolutely terrified of needles. When I was 32 weeks I was diagnosed with Gestational Diabetes so I had to test my blood sugar each day and watch my diet. I was a good patient for approximately one week but the Oreos were too good to pass up. In all seriousness, my levels were never high so I didn't worry much about it. Other than that, I was very fortunate. I never had bed rest (hospital or home), though I did slow down around 36 weeks. 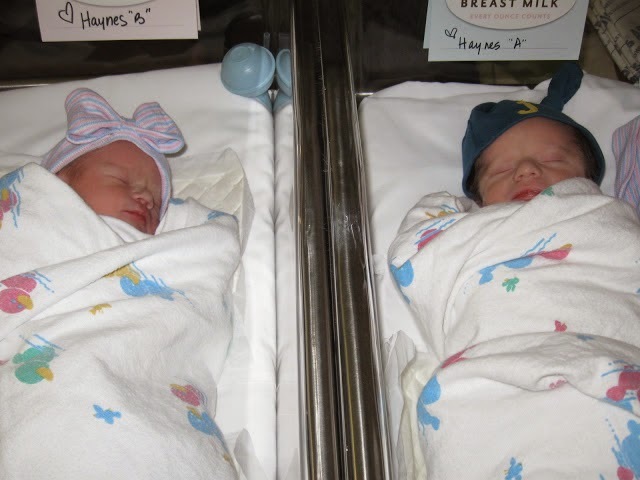 Memorable/funny moment when you were pregnant: Michael and I wanted to vote in the presidential election but the babies would be exactly one week old and we didn't think we'd be up for standing in a long line with two newborns. We were able to vote early and when we walked in the room the entire group turned and stared at my enormous belly. Someone asked if I was going to "have that baby right here." They offered me a chair (I refused) and we finally got bumped to the front of the line. I'm not sure I've ever had that many people absolutely terrified of me. A tiny part of me wanted to make eye contact with someone and yell, "It's happening!!!" But alas, I kept my mouth shut, voted, and waddled off. I was pregnant for three more weeks. C-Section. In the prep room they hooked me up to an IV, put three heart monitors on my stomach and put the blood pressure cuff on my arm. Not long afterward the anesthesiologist came in and I told him how nervous I was about the epidural due to the large curve in my spine. He took a look and assured me my scoliosis wasn't going to be an issue. They had me sit up on the stretcher and then bend over as far as I could. This was the most uncomfortable part of the entire day. My stomach was so huge and I felt like I couldn't breathe. The actual epidural felt strange but didn't hurt. And then the shakes began. Michael held my hand until they said it was time and then they wheeled me into the operating room and told me he would join me in 20 minutes. The anesthesiologist and I joked around for a bit (I remember thinking I'd said some pretty funny stuff but I was so drugged at this point I'm sure I just embarrassed myself). My doctor came in and then the room became very crowded with people. Michael walked in wearing scrubs and carrying the camera. They put the sheet up, he knelt down by my side and it was time. Surgery started at 7:30 am. 10 minutes later my doctor said, "You're going to feel some pressure" and then it felt like someone was punching me in the stomach (although it didn't hurt at all). At 7:41, they delivered Jude Sullivan. I heard a loud cry and then they brought him around the curtain and I saw my son. He looked big and healthy and then my eyes welled with tears so he became blurry. They took him away and started performing initial tests. I felt more pressure and at 7:42, they delivered Sloane Elisabeth. I heard another loud cry and my tears continued. Michael squeezed my hand as they showed us our perfectly healthy daughter. Someone came over to us and said they were going to take Jude to the NICU to monitor him for a bit. He wasn't "transitioning" as fast as they'd like so they wanted to keep a close eye on him. A lady knelt down beside me and told me it was not a big deal and very common with c-sections (especially boys). Any NICU time? If yes, for what reason and how long? Jude spent (wait for it) one whole hour in the NICU. They never touched him, they just monitored him. To this day I don't understand why they took him. Both babies scored a 9 on their APGAR tests. So strange. Did you have any complications after delivery? No complications, but the epidural's effects lasted all day. I felt so hazy and it was the most frustrating feeling in the world. I wanted so badly to be present and remember every moment and instead I spent all of my energy trying to stay awake. I also tried to be "patient of the year" and kept delaying the time between pain meds. Not my brightest move but I blame it on lack of sleep. Take your meds, people. How long did you (the parents) stay in the hospital? 5 days, 4 nights. You know how most people say they can't wait to go home? Not us. We LOVED it there. They basically kicked us out. 1. iPod dock. We made a playlist of some of our favorite songs and it played throughout the day. It was nice to have some white noise and now I think of those precious days in the hospital every time I hear one of those songs. 2. Low-rise pajama pants. That incision is no joke. 3. (Wish I would have had) My Brestfriend Twin Nursing Pillow. Every single time I nursed (every three hours around the clock), Michael had to prop up three pillows on each side of me. Such a pain, especially in the middle of the night when you're not sure where or who you are. Describe one of your favorite moments while you were at the hospital: I will never forget when they brought Jude to us after he'd been in the NICU. It was the first time all four of us were together in the same room and I just had this overwhelming feeling of peace and gratitude. My little family of four was safe and healthy. If you had one piece of advice you could give an expecting mom of twins, what would it be? Michael and I went back and forth on whether or not the babies would remain in our room or go to the nursery during the night. In the end we opted for the nursery and LOVED it. HOWEVER. It made our first night home completely miserable. I'm not kidding, that may have been the worst night of my life. We were absolutely terrified, didn't know what we were doing, and thought we were going to hurt the babies approximately 18 different ways. I cried for six hours straight. Michael was a mess too. We discussed it later and decided if we could do it all over again we would've had the babies stay with us the last night in the hospital. A trial run with professional support/help standing by. I think that would've made the transition much smoother and would've given us the confidence to get through that first night without tears. That voting story is my favorite :) As for the rooming in vs. nursery issue, I'm a bit anxious about this third baby because the hospital where I'm delivering (and most of the hospitals in our area except one, I believe) do not have the option to send baby to the nursery. It's room-in the entire time. I've always been the type to enjoy getting those last bits of sleep before heading home, especially when I had #2, so not getting that with #3 has me a bit worried! I will say- with my first daughter, she stayed in the room with me every night we were in the hospital (I had horrible nurses who made me feel like I was a failure of a mother if I sent her to the nursery), and our first night at home was HORRIBLE. I just remember rocking her, both of us bawling, and her dad just standing there looking at us like "OMG, what did I get myself into?!" We were lucky that my Nana was staying with us for a few days, and she took Savanah, calmed her down immediately, and we all got some rest. But yeah- most horrible night ever. 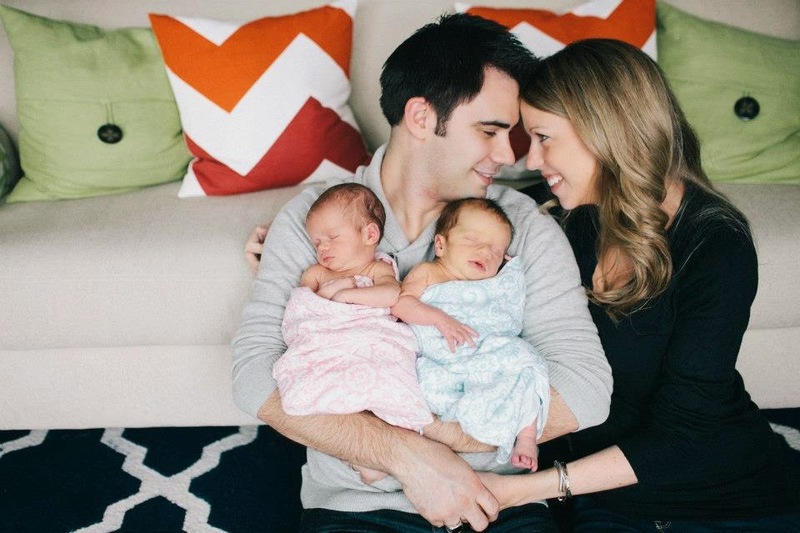 I always love reading/hearing birth stories--and they are extra neat when they is about twins! :) I still am just amazed that you carried 14 pounds of babies!! Like an above commenter said, the hospital I delivered Nolan in didn't have the option of babies staying in the nursery, though they did when I delivered Emily. Guess this policy is maybe becoming more common? Also, after Nolan was born, they took him because he was having "issues transitioning" too, and I never really understood what that meant. 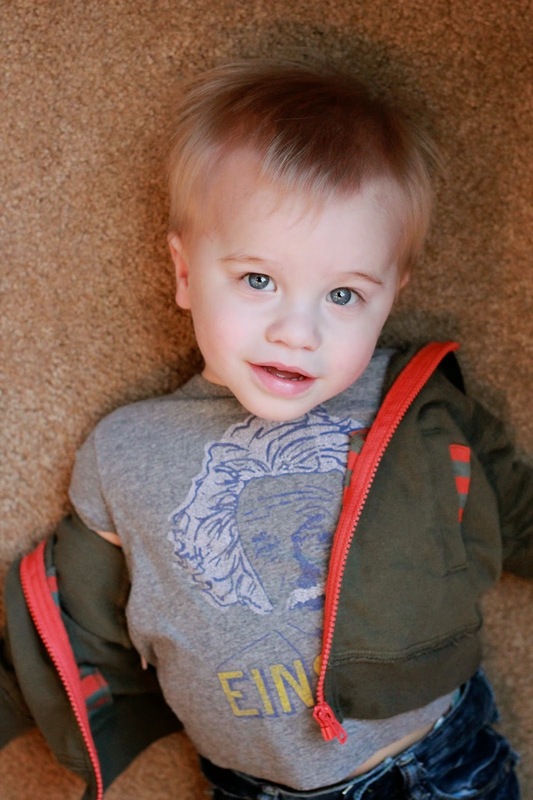 He never went to the NICU, but they wanted to monitor him. Anyways, thanks for sharing your story :) It's fun looking back on those first days and remembering how both awesome and completely terrifying they were! Thanks for sharing! And props to you on making it so far and delivering such big, healthy babies! 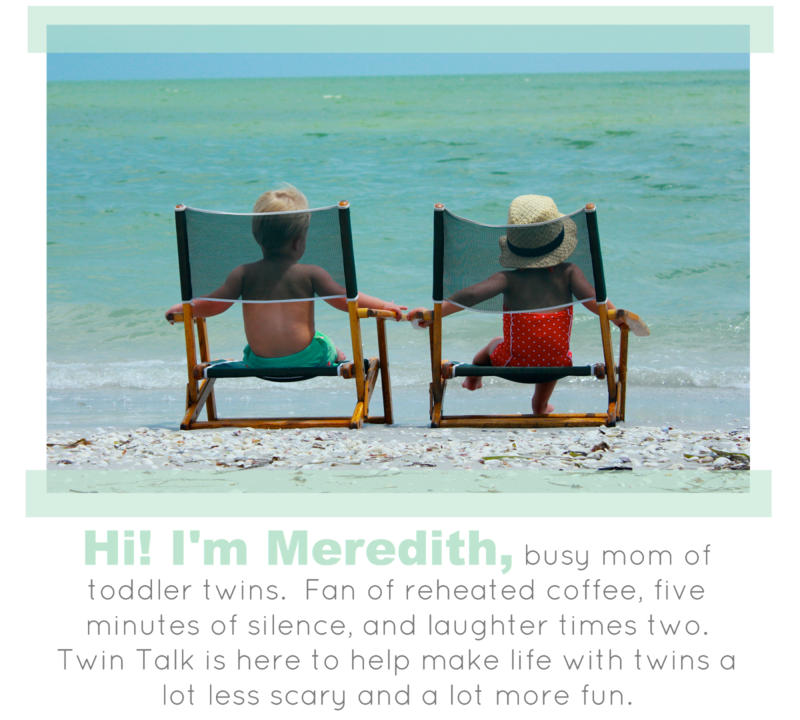 MEREDITH! YOU WERE SO TINY!!! I mean, I'm sure you still are, but for having twins, girl! You looked great! Loved reading your story and you looked absolutely precious! I also wish you would have yelled i'ts happening!! To see the look on those faces would have been priceless!